to GF&P there are around 150 in the entire Black Hills. Non-dominant ram - January 2008. He has decided to hang around for the winter. frequently disappointed as the young lambs die or are taken by predators. chase the male before they mate. Sometimes a male will kick a female to get her to chase him. 10 sheep (3 tagged, five ewes, one ram, and one yearling ewe). 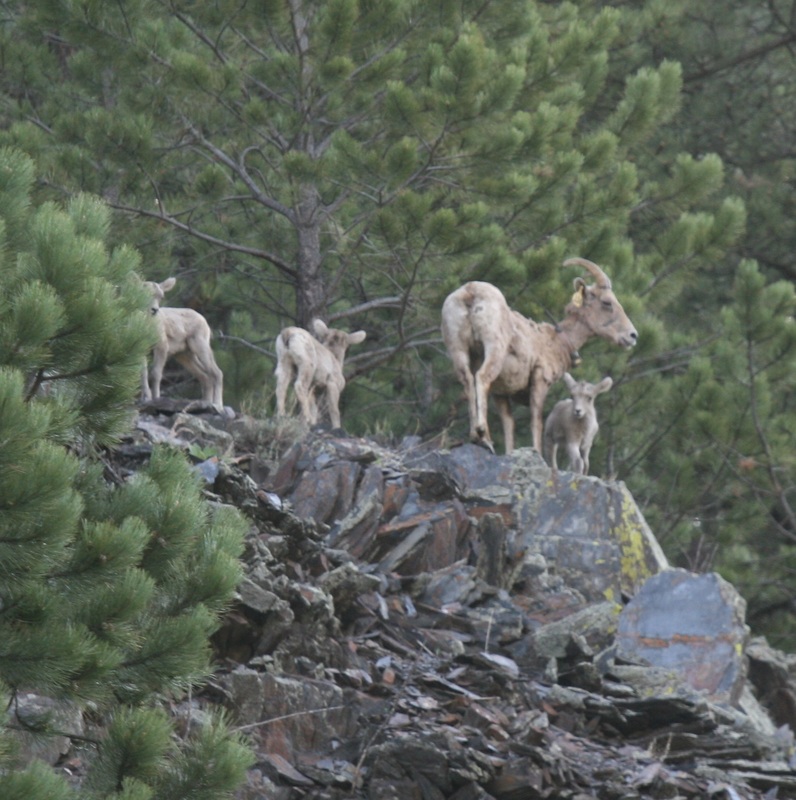 April 16, 2015 - Ewe #134 was observed in Rapid City. 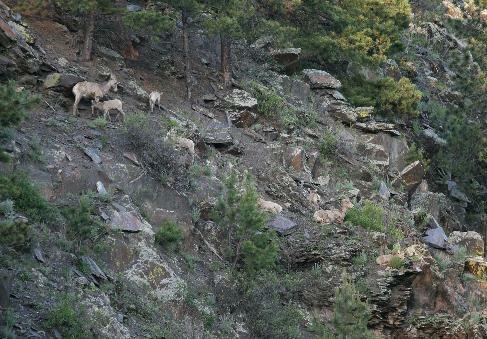 This ewe will make the trek to Silver City soon. July 7, 2014 - A lamb is put down by GF&P after being rejected by its mother. 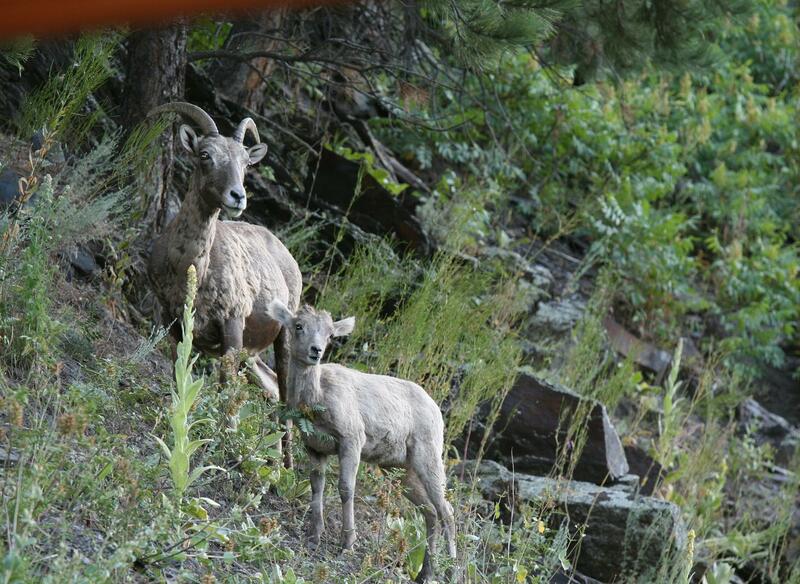 It suffered from severe pneumonia..
July 6, 2014 - Eight ewes, a young ram, and a healthy lamb are observed in Silver City. March 31, 2014 - One ewe on cliff above meadow. On her way to lambing site. First sighting of the year. 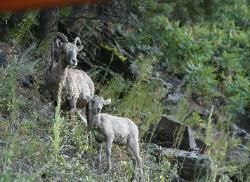 September 6, 2013 - One ewe #205 in the meadow (coughing slightly) with its lamb. Last sighting of the year. June 11, 2013 - Three ewes on the meadow (#148 plus two unmarked). Up on the cliff and waiting are three lambs! 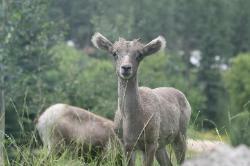 June 9, 2012 - Three ewes (#205 and two uncollared) a sub-adult ewe, and two lambs are now feeding at the meadow. June 4. 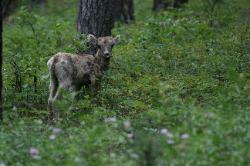 2012 - A newborn lamb is taken by a lion near the birthing sites by the cave. April 7, 2012 - First sighting of the year. Single ewe (collared #204) spotted near the road up from School House before the big turn. 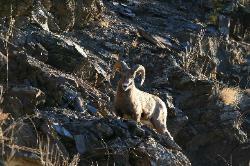 January 20, 2012 - Ewe #134 who comes every year to Silver City was sighted by Cleghorn. Doing well. grazing on a cool sunny afternoon. it is later in the season, it is already eating grass. His chances of survival are low. cave. One of the lambs has a collar. 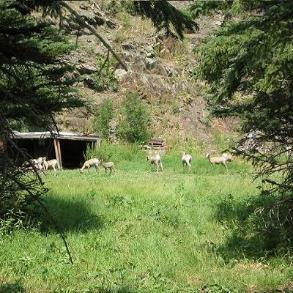 June 23, 2011 - Multiple ewes and four lambs are observed by the cave. We hope that the lambs are able to make it through the summer. over the place. There is no hesitancy with this one. August 17, 2010 - Last sighting of the summer. Three mature ewes on the meadow. 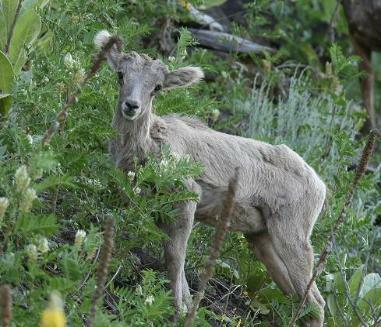 August 12, 2010 - A very small lamb is found dead on Gorman Gulch. around the cave 1.2 miles upstream from town. antenna would get tangled on branches. No lambs yet. then climb up the hill in mid-afternoon. October 25, 2009 - A lone ram descends to the meadow. Hangs around for a week and then leaves. 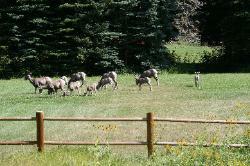 August 21, 2009 - A pair (ewe & lamb) spend morning in the meadow. The main group has migrated away a few days before. secret? What a pleasant surprise. other two and probably younger having been born later in the season. July 15, 2009 - A ram comes and goes. Feeds in the meadow for a short while and then heads up the cliff. 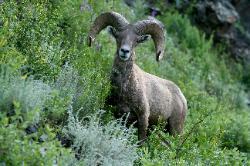 He is a large ram with a 3/4 curl. sheep that was sighted a few weeks ago. longer this year. We hope to see more in the days to come. August 4, 2008 - Twelve ewes but no lambs. better to leave the lamb there rather than take it in for rehabilitation. 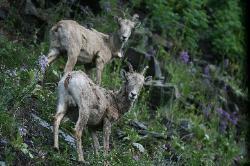 The lamb slowly limped up the cliff where its mother was waiting. pond. With the straggling ewe and lamb there would be a total of 15 sheep. 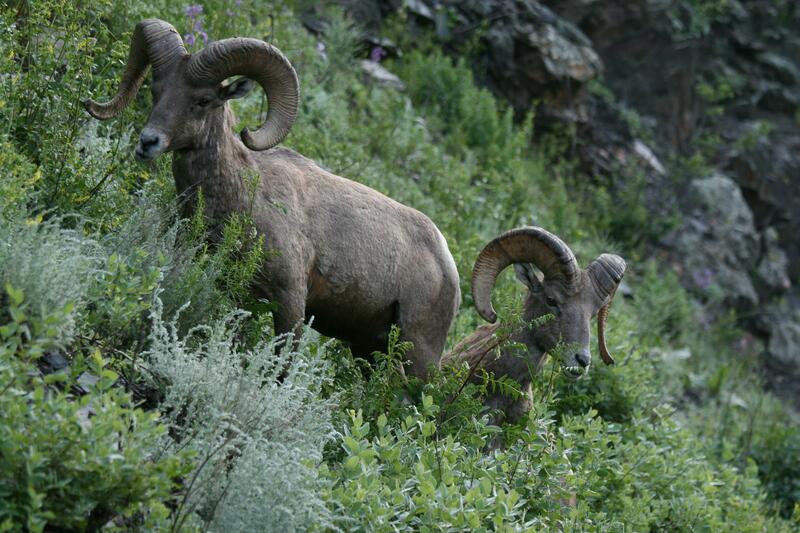 July 9, 2008 - Three rams have frequented Silver City in the last few days. It is uncommon to see rams around this area in the summer. lambs have not been seen for a few weeks. We hope that they are doing well and look forward to seeing them again soon. other lambs. One of the ewes had a radio collar. looking around and getting used to their summer habitat. Both ewes appear to be pregnant. the arrival of the herd. pasture. It may be the same one that wintered here last year. However, he is now bigger and healthier. He has a 3/4 curl. Sighted again off and on in early November around the school house. a few frosts and obvious signs of fall. the herd was mostly non existent this season. 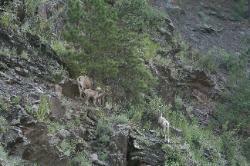 June 2007 - Three newborns tentatively negotiating the cliffs. Very rarely do they come down with the adults. The group is now at 17.
hours. At least two appear to be pregnant. and is easily spooked by the marmots and flying birds. 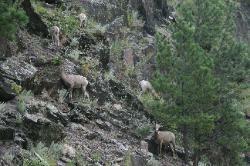 indicated that in the Winter of 2008 some animals may be moved to the Southern Hills. more often to feed on the new grasses and perhaps anticipating the arrival of the rest of the herd. coughs coming form the herd. July 31,2011 Abandoned sheep with sore mouth disease. 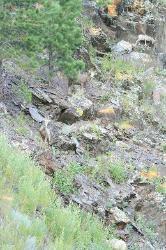 Observed on interesction to lower Jenny Gulch. July 29, 2011 - Two lambs. One collared. Five altogether for lambing season. One dies of sore mouth disease. July 2012 - Seven sheep come early mornings and early evenings.